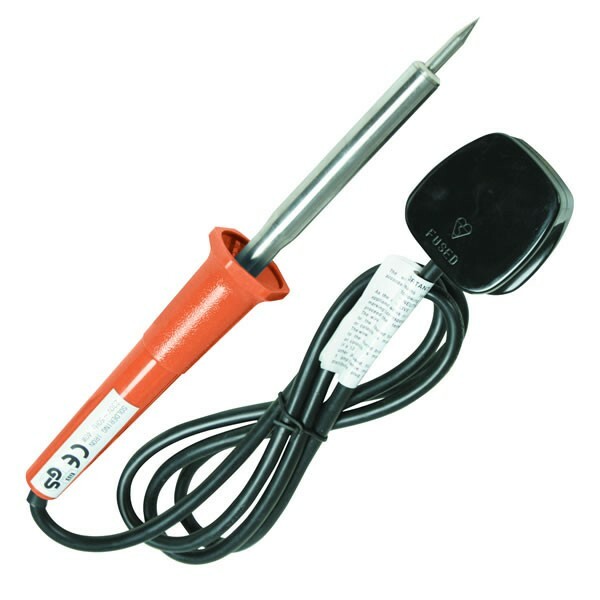 Usually a soldering iron takes a couple of minutes to get adequately heated up to melt the solder, after which the heat generated is much above the requirement and is wasted. The solder itself also produces toxic smoke which needs to be extracted with the likes of Integrated Air Systems extraction devices. Moreover, excessive heat decreases the life of the bit and the element, causing serious damage to the delicate ICs, capacitors and PCB tracks. A common solution to this problem is to use a diode in series with the mains and the load, so that the iron gets only half the AC cycle. But this process has one serious drawback, that it slows down the normal rate of heating. Thus, after switching on the power, one has to wait for a long time to start work. This can create a lot of annoyance especially when one is in a hurry. 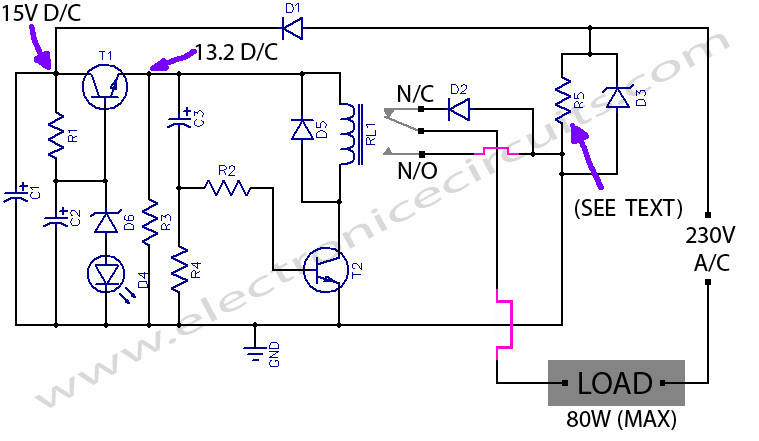 The circuit described here solves this problem in a simple and inexpensive way and can be used with various types of loads of up to 80 watts. As the mains is switched on, an approximate 15V drop of the positive half cycle across R5 is detected and supplied to T1, which acts as a voltage regulator. Zener diode D6 together with diode D4 (yellow LED) stabilises the emitter voltage of T1 at 13.2V DC which is then delivered to the relay circuit built around T2 and C3. Capacitors C3 charges through the base-emitter path of T2 and causes the relay to actuate. which in turn allows both the half cycles of the AC mains to flow through diode D3 and R5 to the load to heat it up at a normal rate. After a certain lapse of time (about 2 minutes preset ), C3 saturates and T2 stops conducting through the relay, thus switching on series diode D2 to allow only half of the AC cycle through the load. After switching off the system, C3 discharges very slowly through R3 and R4. Before C3 gets completely discharged, if the power is switched on again, C3 takes a shorter time to reach the saturation level, thus switching series diode D2 much earlier than the preset time to prevent double heating of the load. However, if the circuit is switched on only after a few seconds of switching off, C3 gets no time to discharge and the relay does not actuate at all. MOreover, if the relay circuit fails due any reason and T2 does not conduct, no harm is done to the load because in that case D2 remains in series with it. Thus the circuit offers complete protection to the load. As stated earlier, the given value of C3 gives a delay of 2 minutes. However, a 1000µF capacitor can also be used to produce a 41/2 minutes delay. R5 maintains a drop of about 15V across itself. So, for use in different load conditions, its value changes as shown in table 1. The whole circuit can be mounted on a PCB and fitted in an adapter case (7.6cm *5.1cm * 6.4cm) and used as a mains plug. Since R5 gets heated up during the operation, it should be kept well isolated from other components. hi i am using an electronic fan regulator, with a micro switch in the soldering iron stand. when the solderin iron is kept on the hook the switch will go open and include the regulator, which we can adjust to suitable level during non use of iron. once the iron is taken for use regulator is shorted and i get full voltage. as i have optimised the regulator 15 to 20 seconds is sufficient to get full heat for my soldering activity. what can i substitute to the sl100 transistor? this is doesn’t work.i have used D313 instead Sl 100.ground point connect to earth of plug switch.C1 get burn.then it changed to 100uF 250v.then 220ohm resister burn.how solve it?please send me quick reply.